I bought this photograph on eBay. 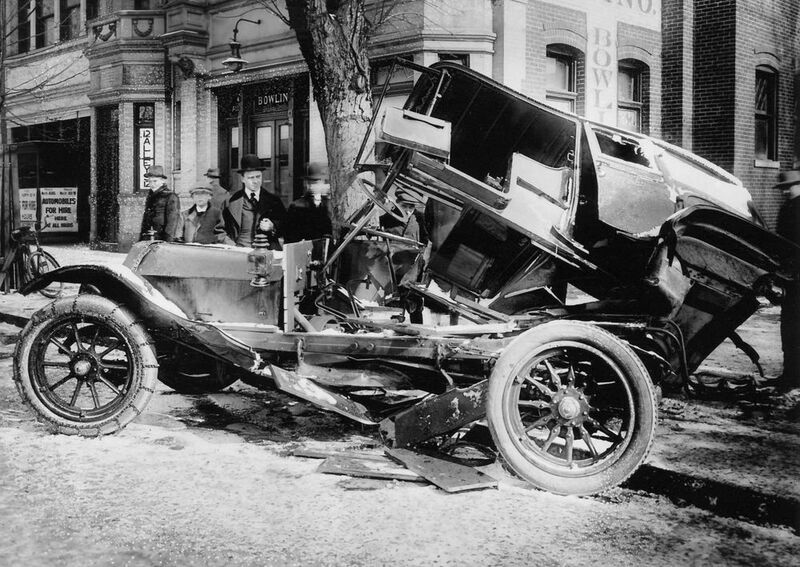 Its title was "Vintage Car Wreck/Accident 1916." There's little reason to accept that date as authoritative, but it's probably about right. The side lamp (next to where the driver's side door should be) is one reason for thinking so. It's a gas, or acetylene, lamp, which was the only lamp technology available in the early 1900s but was largely phased out of new cars by 1920. The headlamps on this car may be electric. Many cars came standard with electric headlamps and acetylene side lamps—including the Model T, which was first equipped with electric headlamps in 1915 but still had gas side lamps at that time. To me, this photograph captures the changing nature of automotive risks. Until the early 1930s, when the steel body came to dominate the auto market, car bodies were made of sheet-steel siding on top of wooden frames. In bad accidents, the body would shear off, as this one has, taking the cars occupants with it, often slicing them with splintered wood and shattered glass. (Safety glass was not widely adopted in US autos until the late 1920s.) In contrast, during accidents in all-steel body cars, those who were not thrown from the car slammed into obdurate steel beams. Additionally, the lion's share of cars came with open bodies until the early 1920s. Closed bodies introduced new problems, including limiting the driver's sight and hearing. Mirrors—which did not come standard but had to be bought on the aftermarket—were originally advertised as a means of dealing with the closed bodied car's novel risks.